Catholic Life, Collective Worship and R.E. St. Andrew is Class 1's special friend in heaven who we ask to watch over us. His feast day is on 30th November so our friends in Class 13 helped us to lead a whole school Mass today to celebrate our Class Saint. Andrew, like his brother, Simon Peter, was a fisherman and he was one of Jesus' first disciples. 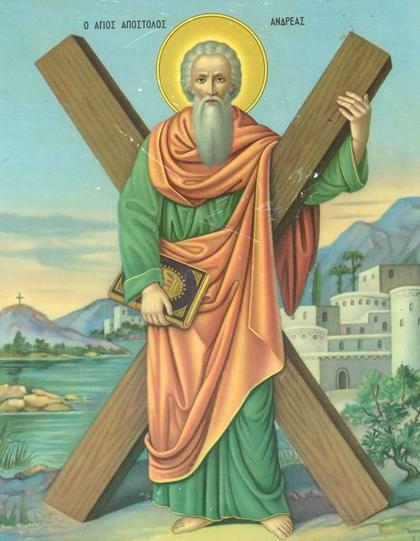 It is believed that after Our Lord ascended into heaven, St. Andrew preached the Gospel in Greece. He is also said to have been put to death on an 'X' shaped cross: however, unusually, he was tied to the cross instead of being nailed to it and he suffered like this for two whole days before he died. St. Andrew is also one of our School Houses and also the patron saint of Scotland.